7 days in, y’all. No eggs. No fish. No dairy. No chicken. No turkey. No way. Yes way. Tough, in some moments. Easy in most. Worthwhile all the way around. I foresee that I’m going to have an issue eating out at restaurants, and at social gatherings. New Years Eve Party. This was all I could eat. At least the tomatoes were tasty, and the strawberries were sweet. New Years Day lunch with Daniel, at HM Lounge. He had fried chicken wings, waffles, and scrambled eggs. I done good, y’all. I didn’t sneak nan bite off his plate. Plus, these veggies were bomb. Anyway, hope y’all were able to pleasantly bring in the new year. Be it via the bed, or like me, by way of trap, rap, and champagne toasts, I pray it was all you needed. Tis January 2nd, and I’m yet moving about, doing my best to avoid overly processed vegan foods, tryna be healthy, tryna be well, tryna be fine as vintage wine. And how do I best accomplish this? Through cooking! 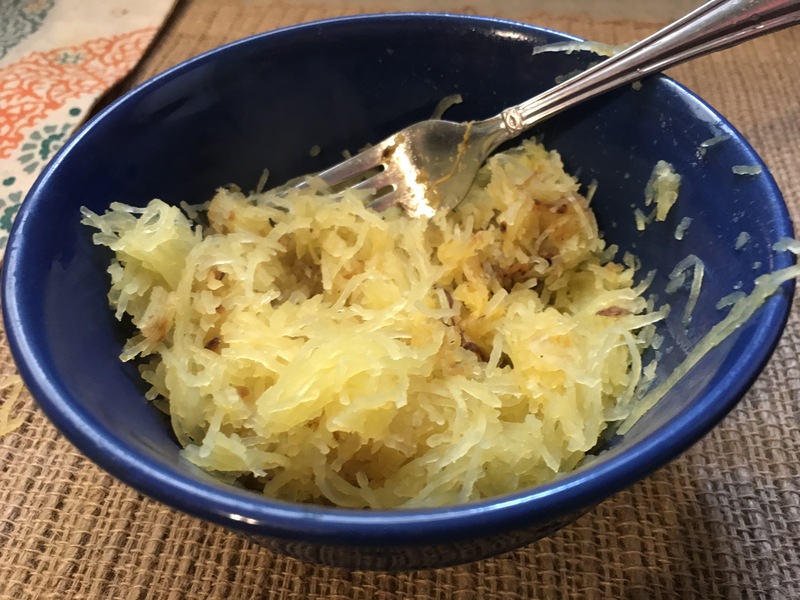 This morning I cooked spaghetti squash. Super easy. Simply slice the squash lengthwise, discard the pulp and seeds (or roast the seeds), spray with a cooking oil, and roast, flesh side down, for about 30 minutes. Once it’s removed from the oven, let it cool, and scrape out the insides❤️Of course you gotta season it. It has a naturally stringy consistency, just like spaghetti. BUT, it doesn’t have a pasta texture. It’s got a slight bite to it. This vegetable is surprisingly sweet, almost as if you added sugar before cooking type sweet. There are even spaghetti squash desserts! Desserts with a veggie base…that’s rich, y’all. But I opted for a savory dish by pairing it with a homemade tomato sauce. Again, I usually google 2 or 3 recipes, then adapt them them to my liking. I didn’t have time to create a more authentic Italian sauce that’s slow cooked with a low simmer. This is simply fresh tomatoes, canned stewed tomatoes, tomato paste, and of course, garlic and onion. I was able to eat off this dish for about 3 days, and that’s with me giving my mom half of the cooked squash. Yea, my appetite is still small. I honestly know I need to consume more calories. And I’m honestly having a hard time doing that, without adding too many carb heavy foods. To remedy that, to an extent, I’ve incorporated more whole grains like granola, and my dessert go to, Ezekiel cinnamon raisin bread. I’m trying to stay away from warming my food in the microwave. I just tossed the squash and sauce in an ugly tin pan, and warmed it for about 10 minutes. 7 days in, plenty more to go. If I’m going to keep this up, I need to step up my game. I need to plan more, buy more snacks, and buy more of the foods that I know I can eat, even when I don’t have an appetite.